Santa Cruz Syndicate’s Steve Peat (teammate of local hero Greg Minnaar) has finally beaten French rider Nicolas Vouilloz’s record with his 17th career victory! 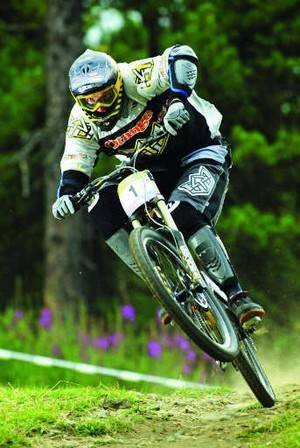 At the downhill event in the Nissan UCI Mountain Bike World Cup third round, in Vallnord, Andorra – MTB history was made when Peat took victory only two-hundredths of a second ahead of current world champion, Animal-Commencal’s Gee Atherton. In the women’s event, Maxxis-Rocky Mountain’s Sabrina Jonnier took her second consecutive downhill World Cup win, and overtook Tracy Moseley (Trek World Racing) for the overall lead in the women’s series. Not taking anything away from the other winners, but I think this weekend definitely belonged to Steve Peat, who broke a remarkable record. Congratulations from everyone here at MTB Shorts! This entry was posted in Hot Off the Press and tagged andorra, bike, gee atherton, greg minnaar, mountain, mtb, mtb shorts, nicolas vouilloz, nissan uci mtb world cup, record, round 3, santa cruz syndicate, shorts, steve peat, vallnord by mtbshorts. Bookmark the permalink. A week or two ago I found your blog and have been following along steadily. I decided I might leave my first comment. I dont know exactly what to say except that Ive loved reading it. Nice blog. I intend to continue coming to this website frequently. I have also grabbed your rss feed to get any updates. Hey! Thank you for the compliment! What’s ur fav category?